Title £10.00 Want to learn more about our coffee subscription? £25.00 Want to learn more about our coffee subscription? £50.00 Want to learn more about our coffee subscription? 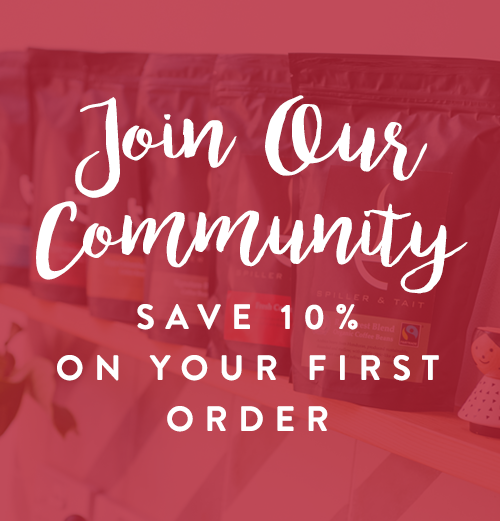 £100.00 Want to learn more about our coffee subscription? Shopping for a coffee lover but not sure what coffee, or coffee kit, to give them as a gift? Give them the choice with a Spiller & Tait Coffee e-gift card. Our e-gift cards are sent to you by email containing easy instructions on how to redeem them at checkout. You then e-mail the e-gift card to the person of your choice. Our e-gift cards have no additional processing fees and can be redeemed for the purchase of any item on the Spiller & Tait website. Your e-gift card will be emailed to you immediately.